The dark ambient sounds and music within these arrangements was created and performed on various virtual instruments (see notes below). In some cases original audio recordings were used as sources then re-shaped with granular synthesis to turn these recordings into playable expressive instruments with huge sonic range and motion. The album was mastered by the wonderful Gannon Kashiwa who is the Director of Digital Media at the Denver Museum of Nature and Science – so you'll hear the incredible sonic range and detail of these pieces if you go for the downloads. The streaming versions just don’t do the tracks justice. With this in mind I’m making the entire album (14 minutes of horror in 5 soundscapes) available for only $3. I hope this is a no brainer price that makes you want to go for the lossless CD Quality FLAC or at least MP3 320 (click here if you have questions about format). A lot of work went into the sonic detail so it’s worth it to take the time to listen on good system with a sub – or with great headphones. No earbuds please – lol. The Liner notes pasted in below with the addition of “Synths Used” for you Modulate This! readers. Note tracks 2-4 each use a single synth and single deep performance preset programmed from INIT. I hope hearing these tracks inspires you to dig deeper into programming from INIT with a smaller number of synths in your rig. Going deep allows you to create expressive patches and presets with performance in mind and transcend these synths making them true instruments. I’ll also add that the entire album was produced and mixed with Ableton Live. Gannon Mastered in Pro Tools. Thanks for your support and If you enjoy the album please pass it on. Happy Halloween! Amygdala kicks in as you enter the fear zone. Remember, it's all in your head! 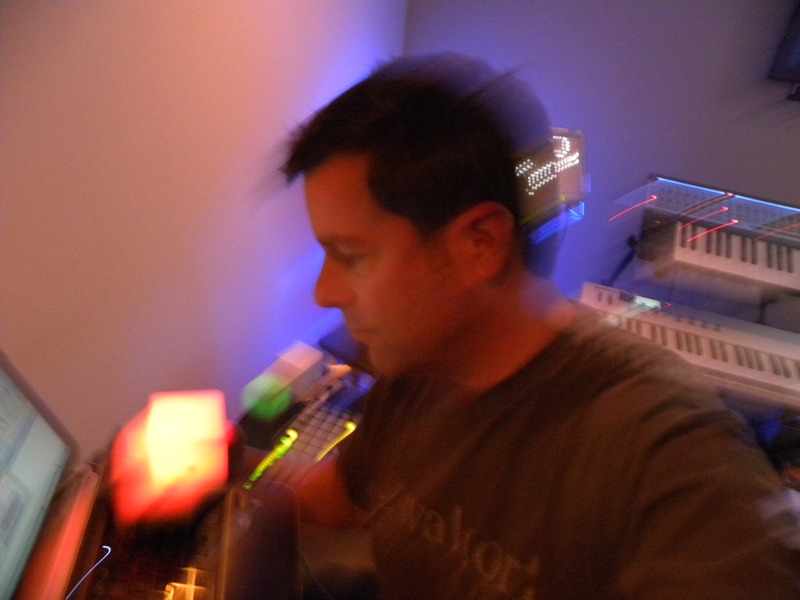 I use hand crafted synthetic sounds (subtractive and additive synthesis) to create strange tones, textures. and rhythms to build tension. Fast note-runs, and radical tempo changes will creep you out. This piece was performed using Percussa AudioCubes. Note I released this as a single in 2011. Even if you've heard it before I recommend you buy the album to get this new high-resolution remix. For this remix I reprogrammed some of the effects, remixed the track a bit, and then re-rendered with highest quality synth settings. Plus this track and all others were mastered by Gannon Kashiwa and it sounds simply incredible! Synths Used: Waldorf Largo, 4 Instances of Image-Line Harmless. I also used Percussa Improvisor with original sequences controlled from AudioCubes which got fed into Live to drive the virtual synths. Further editing and production was done in Live. When you are alone in the dark your mind will play tricks. Over the last year I've been spending time listening to the tone. harmonics, overtones, and distortion created by expressive electric guitar greats like David Gilmour. "Alone in the Dark" is my exploration of expressive manipulation of harmonics and distortion with a single synthesizer patch custom programmed. As a result you'll hear me go beyond the sonic range of guitars into the sub-harmonic realm. Your brain is on overload as you run for your life through a dark building searching for the exit. I broke a long complex original audio recording into small chunks called "grains" with a custom patch in a virtual instrument called Absynth. My patch allows me to traverse, manipulate and perform with this massive sample as if it's an expressive instrument with a very unique harmonic palette. There is a dim golden light ahead in the dark. Between you and the light, there is a spider and of course a large web blocking your path. Was that something crawling down the back of your neck? Like the last track, this is custom granular synth performance. Inspired by the film Serenity. I used a variety of custom programmed virtual synths and effects to create this lush but dark ambient piece. Note I released this as a single in 2011. Even if you've heard it before I recommend you buy the album to get this new high-resolution remix re-mastered by Gannon Kashiwa. Synths Used: Native Instruments Absynth 5, 3 Instances of Tone2 Saurus, Rob Pappen Predator FX & RP-Verb.